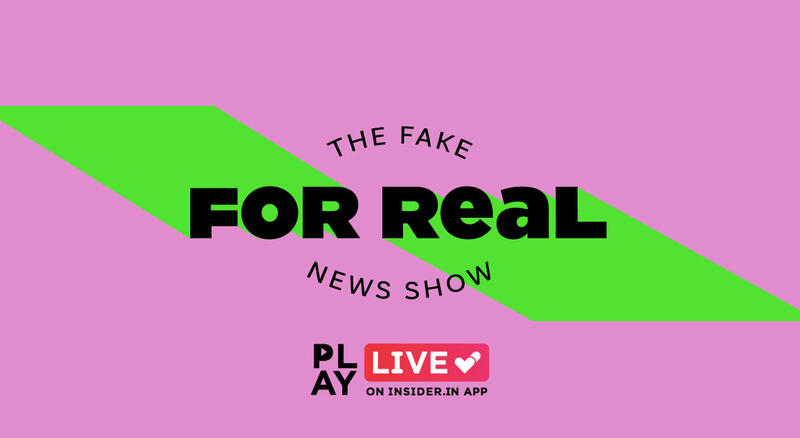 This interactive live show will keep you second guessing on which news is fake and which one is real. Try the new interactive live video feature and play this quiz show only on the Insider.in app! From turmeric related cancer cures to currency notes embedded with GPS sensors (lol), we’re literally surrounded by fake news. It's a big problem, and it’s only getting worse. If you can tell real news from the fake, “For Real” is the show for you. Pick out the fake news and win upto Rs.10,000 which will be credited to your Insider wallet. Ab hogi sach ki jeet! Sach ki jeet! Pick out the fake news and you can win movies vouchers worth Rs. 250. 1. How do I use my rewards? Rewards are credited directly to your Insider account and will reflect in your profile page- https://insider.in/users/me. You can then use your rewards to buy tickets for any event on Insider.in! Check out awesome events near you on the insider.in app. 2. I couldn’t participate. Can I watch the video elsewhere? Unfortunately, you can only participate in shows that are hosted on Insider.in live! However, we do have a bunch of exciting shows coming up. To stay updated, follow the shows you’re looking forward to under the ‘Play it Live’ section on the app. We will be archiving videos as well - you can catch the first episode below! 3. How do I check my historical scores? 4. My screen froze after I answered the last question. How do I check if I've won? 5. How do I check how many lives I have currently? To see how many lives remain unused, please visit your Insider profile page here- https://insider.in/users/me . You can use these lives in any of our subsequent live shows! To stay updated, just follow the shows you’re looking forward to here under the ‘Play it Live’ section on the app. 6. What are the recommended tech specifications to participate in Live on Insider.in? We recommend you use the latest version of Android and iOS and be on either a WIFI or 4G connection.